Remember the Pocket Tripod Too! I constantly remind people to keep their compact cameras with them while on the go. That way if a great shot presets itself, they can grab it. But when going out for an evening stroll, take the portable tripod too! Compact tripods, such as my favorite, Gorillapod by Joby ($22), enables me to use sign posts, newspaper machines, and just about anything else I can find standing still on the street, and use it for making long exposures. 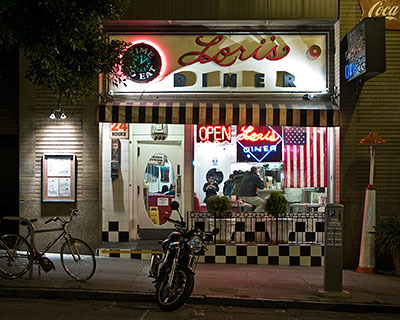 In the case of this image of Lori's Diner on Mason Street in San Francisco, I use the Gorillapod and a parking meter to make a 1/4 of a second exposure. This technique will improve your street shooting at night, enabling you to capture sharp shots at low ISO settings (I used ISO 80 for this image on a Canon G9, and there is virtually no noise at all.) Then all you have to do is set your Drive mode to "self-timer," and the magical world of lights at night become your personal photo studio. Photo by Derrick Story using a Canon G9 and Gorillapod. I totally agree, if you are going out in low / evening light and take you camera with you, it is a waste unless you have something like a Gorillapod to keep any photographs you might take lovely and sharp. I keep mine with my camera all the time just in case. What would you recommend for DSLR cameras, or is the Gorillapod enough? I'm going to Scotland in April but don't want to try bringing a normal size tripod. If I have to go without a tripod, so be it, but I'd like the option. I assume Derrick used the original small Gorilla pod, which is ideal for travel. I have a Canon G9 and would like to use the same. The Canon G9 weighs 329 grams and the max wt recommendation for the small Gorilla pod is 275 grams. Does the extra 50 grams matter? Hi there, cheers for the fantastic article, a truly great start for the 2010, keep up the excellent work, Tracy. Hello there, thanks for the wonderful blog, a really great beginning for the 2010, keep up the fantastic work, Anne. Hi there, thanks for this excellent post, a truly great beginning for the 2010, keep up the wonderful work, Rachel.